Knee bursa are small fluid filled sacs which contain synovial fluid. Bursa are found all over the body and there are approximately fourteen around the knee. They sit between two surfaces, usually muscle and bone, to reduce friction, a bit like ball bearings. This allows everything to move smoothly preventing inflammation. 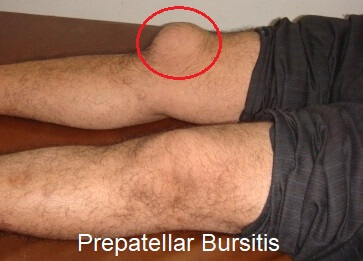 Sometimes the knee bursa get damaged, known as bursitis, which can cause pain. This is usually when there is excessive friction over the bursa causing it to either become inflamed, or when it dries out so it no longer works properly. 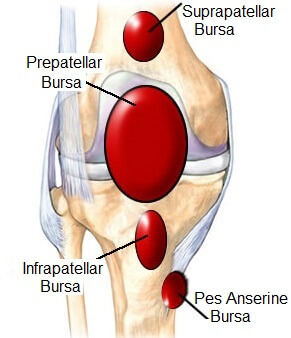 So lets have a look at knee bursitis anatomy, particularly focusing on the 5 main knee bursa, which are the ones that are most commonly injured. Then we will look at what can go wrong with the bursa. The prepatellar bursa is found directly in front of the kneecap. Repetitive or prolonged, forwards kneeling places a great deal of pressure and friction on the the knee bursa which can lead to inflammation. Inflammation is known as prepatellar bursitis, or Housemaids Knee, but today is more common in trades such as roofers and carpet fitters. There are actually two infrapatellar bursa both found underneath the kneecap protecting the patellar tendon. They are known as the deep and superficial infrapatellar bursa. 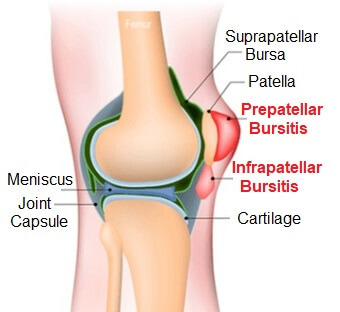 Inflammation here is known as infrapatellar bursitis, or Clergyman's Knee, and is usually caused by more erect kneeling than with prepatellar bursitis. This is found on the inner side of the knee approximately two inches below the joint between the tendons of the sartorius, gracilis and semitendinosis muscles and the medial collateral ligament. Inflammation of Pes Anserine is especially common in runners and swimmers - visit the pes anserine bursitis section to find out more. The semimembranosus bursa is found at the back of the knee. It sits between one of the hamstring muscles (semimembranosus) and the medial head of one of the calf muscles (gastrocnemius). 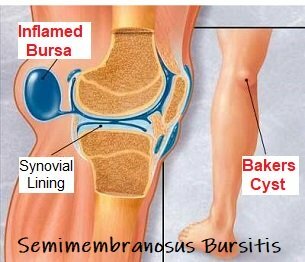 Inflammation of the bursa is known as semimembranosus bursitis, or, more commonly, a Bakers Cyst, which can be extremely painful. This is ususally caused by excess fluid in the knee, usually from an injury or arthritis, which leaks back into the bursa causing it to swell. A lump forms behind the knee, like a squashy orange. This is found above the kneecap underneath the quadriceps tendon at the bottom of the thigh preventing friction from the femur. Problems usually develop in the bursa when there is muscle tightness or weakness which causes excessive friction on the bursa and can lead to knee bursitis. This results in more friction on the bone and muscles/tendons leading to bursa knee pain. Usually a combination of strengthening and stretching exercises, medication and injections helps them to recover. Inflammation and irritation of the knee bursa is a common cause of knee pain. To find out more about what can go wrong, visit the bursitis of the knee section to find out more about prevention and bursitis treatment. To find out more about this different structures in the knee, including the muscles, ligaments and cartilage, visit the anatomy section. Alternatively, if you have a problem with your knee and would like help working out what is causing it, visit the knee pain diagnosis section.